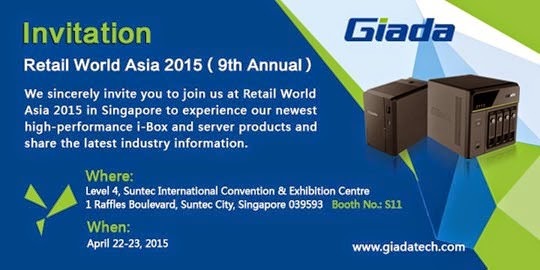 Giada, the industry leader in Mini PC, embedded systems and expert of Small & Medium Enterprise servers, will fascinate your eyes with best-in-class Mini PC, Server and IPC motherboard product lineup at Retail World Asia 2015 in Suntec International Convention & Exhibition Center from April 22nd to 23rd. Retail World Asia exhibition hosts local and global solution providers and is attended by decision makers from across the region, the event is unrivalled across Asia in scale and experience. In 2014, Giada stood out with a rich blend of features and technologies and is now making great strides to extend its product lines with server, Mini PC and IPC motherboards. In the first quarter of 2015, an enhanced product lineup of Giada Mini PC and server will make their debut at Retail World Asia 2015, delivering the “WOW” experience to visitors, hardware enthusiasts, as well as industry insiders and peoples searching for professional solutions. At first place, Giada shines the spotlight on its newly introduced server products. The 2-bay Micro Server barebone GT200 adopts the high-performance Intel® Celeron® Processor 1037U, with increased computing speed while greatly decreasing the total power-consumption. The upgraded 4-bay version GT400 can be utilized as private cloud data center, print server, web server and ERP server by supporting file sharing, encryption and backups, fully fulfills the demand of the small and medium enterprise. Also a series of own-developed Intel-based server motherboards will be presented at Giada booth. Apart from the server and server motherboards, Giada will bright up the show with its enhanced mini PC series. Aiming at providing more value-conscious solutions for industry users；for example, the G320 with 6 screens support, ideal for high resolution digital signage market, or the fanless barebone series F300 which can be applied at industrial control fields, as well as the thin-client series I200 which shows great potential in virtualization technology applications with outstanding portability. In addition, for high-end gamers, the unparalleled gaming series Mini PC D2309U is another star product that you shouldn’t miss. Adopting the Intel® Core™ i7 Skylake Processor and NVIDIA® GeForce® GTX950 GPU, D2309U is the great gaming machine for those who want to ultimate gaming experience. Comparing with the previous generation model D2308U, it will stun the visitors with combination of lightning-fast data processing capability with hyper-realistic and smooth 3D graphics. Come and visit our booth S11 in Suntec International Convention & Exhibition Center from April 22nd to 23rd to get more information about Giada’s new products and solutions!